^ "Commemoratives | Classic Commemorative Silver and Gold (1936) San Francisco Oakland Bay Bridge Opening | Coin Value Guide". whitman.com. Retrieved 2018-12-18. ^ "BICYCLE AND PEDESTRIAN PATH | Bay Bridge Info". baybridgeinfo.org. Retrieved 2018-12-18. 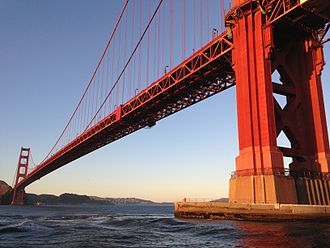 The American Bridge Company is a civil engineering firm that specializes in building and renovating bridges and other large civil engineering projects. Founded in 1900, the company is headquartered in Coraopolis, the firm has built many bridges in the U. S. and elsewhere, the Historic American Engineering Record notes at least 81. American Bridge has built or helped build the Willis Tower, the Empire State Building, the Chrysler Building, launch pads, during World War II, it produced tank landing ships for the United States Navy. Competitors include Walsh Group, Flatiron Construction, and Skanska USA, related companies include American Bridge Holding Company and American Bridge Manufacturing Company, both headquartered in Coraopolis. American Bridge Company was founded in April 1900, when JP Morgan led a consolidation of 28 of the largest U. S. steel fabricators and constructors, in 1902, the company became a subsidiary of United States Steel as part of the Steel Trust consolidation. It went on to do work across the nation and around the world, during World War II, the company built warships for the U. S.
Navy. In 1944, American painter Thomas Hart Benton recorded the construction and launch of LST768, producing numerous drawings, the company went private in 1987 and was sold to Continental Engineering Corporation in 1988. The town of Ambridge, was an American Bridge company town, both municipalities are on the Ohio River near Pittsburgh, with access to many steel suppliers, as well as to waterborne and rail transport, to allow shipment of components and subassemblies. This is a representative, not an exhaustive, orinoco Bridge, Venezuela 25th of April Bridge, Portugal Built the worlds longest arch bridge on three occasions. 25 April Bridge in Lisbon, Portugal First stiffening truss replacement on a loaded, lions Gate Bridge, British Columbia, Canada The ongoing Eastern span replacement of the San Francisco–Oakland Bay Bridge, in a joint venture with Fluor Corporation, American Bridge-Fluor. Built the world’s tallest building on numerous occasions, john Hancock Center, Chicago Aon Center, Chicago Columbia Seafirst Center, Seattle U. S.
Willie Lewis Brown, Jr. is an American politician of the Democratic Party. He served over 30 years in the California State Assembly, spending 15 years as its speaker, and served as the 41st mayor of San Francisco, the first African American to do so. Under the current California term-limits law, no Speaker of the California State Assembly will be permitted to have a longer tenure than Browns, the San Francisco Chronicle called Brown one of San Franciscos most notable mayors who had celebrity beyond the citys boundaries. Brown was born in Mineola and graduated from Mineola Colored High School in 1951 and he moved to San Francisco in 1951, attending San Francisco State University and graduating in 1955 with a degree in liberal studies. Brown earned a J. D. from University of California and he spent several years in private practice before gaining election in his second attempt to the California Assembly in 1964. Brown became the Democrats whip in 1969 and speaker in 1980 and he was known for his ability to manage people and maintain party discipline. According to The New York Times, Brown became one of the countrys most powerful state legislators and his long tenure and powerful position were used as a focal point of Californias initiative campaign to limit the terms of state legislators, which passed in 1990. During the last of his three allowed post-initiative terms, Brown maintained control of the Assembly despite a slim Republican majority by gaining the vote of several Republicans, near the end of his final term, Brown left the legislature to become mayor of San Francisco. 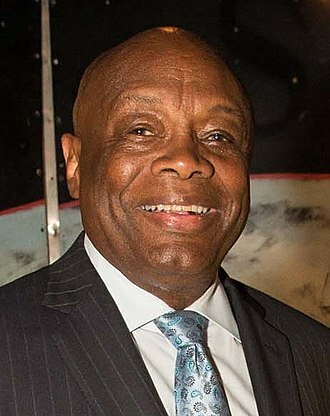 Brown served as San Francisco mayor from January 8,1996 until January 8,2004 and his tenure as mayor is marked by a significant increase in real estate development, public works, city beautification, and other large-scale city projects. 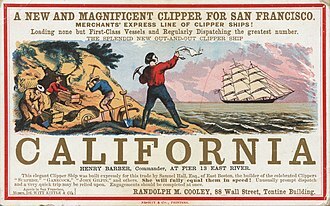 He presided over the era at a time when San Franciscos economy was rapidly expanding. Brown presided over the city’s most diverse administration with more Asian Americans, Latinos, gays and he increased San Franciscos funding of Muni by tens of millions of dollars and ended the citys policy of punishing people for feeding the homeless. 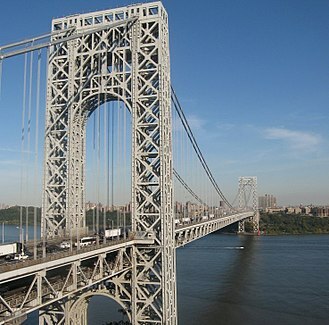 A toll bridge is a bridge over which traffic may pass upon payment of a toll, or fee. The practice of collecting tolls on bridges harks back to the days of ferry crossings where people paid a fee to be ferried across stretches of water, as boats became impractical to carry large loads, ferry operators looked for new sources of revenue. 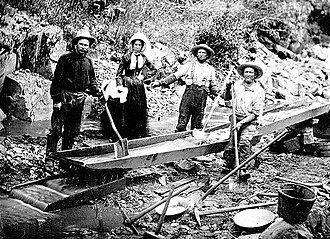 Having built a bridge, they hoped to recoup their investment by charging tolls for people, animals and goods to cross it. The original London Bridge across the river Thames opened as a toll bridge, using interest on its capital assets, the trust now owns and runs all seven central London bridges at no cost to taxpayers or users. In the United States, private ownership of toll bridges peaked in the mid-19th century, in some instances, a quasi-governmental authority was formed, and toll revenue bonds were issued to raise funds for construction and/or operation of the facility. Peters and Kramer observed that. little research has been done to quantify the impact of collection on society as a whole. And therefore they published an analysis of the Total Societal Cost associated with toll collection as a means of taxation. TSC is the sum of administrative, compliance and pollution costs, in 2000 they estimated it to be $56,914,732, or 37. 3% of revenue collected. Nakamura and Kockelman show that tolls are by nature regressive, shifting the burden of taxation disproportionately to the poor and middle classes. Electronic toll collection, branded under names such as EZ-Pass, SunPass, IPass, FasTrak, GoodToGo, electronic tolling proposals that represented the shadow price of electronic toll collection may have misled decision makers. Consumers have additionally endured an increased administrative burden associated with paying toll bills, visitors to a region may incur e-toll tag fees imposed by their rental car company. The Paperwork Reduction Act of 1980 identified and attempted to address a problem associated with the government collection of information. Approvals were to be secured by government agencies before promulgating a paper form, however, the act did not anticipate and thus address the consumer burden associated with funding infrastructure via electronic toll collection instead of through more traditional forms of taxation. In contrast, standard concrete is poured into site-specific forms and cured on site. Precast stone is distinguished from precast concrete using an aggregate in the mixture. Precast are only used within ranges of exterior and interior walls, compressed in concrete and stone, creating a solid but manuverable wall or face. By producing precast concrete in an environment, the precast concrete is afforded the opportunity to properly cure. Using a precast concrete system offers many advantages over onsite casting. Precast concrete production is performed on ground level, which helps with safety throughout a project, there is greater control over material quality and workmanship in a precast plant compared to a construction site. There are many different types of precast concrete forming systems for applications, differing in size, function. Stormwater drainage and sewage pipes, and tunnels make use of precast concrete units, the New South Wales Government Railways made extensive use of precast concrete construction for its stations and similar buildings. Between 1917 and 1932, they erected 145 such buildings, beyond cladding panels and structural elements, entire buildings can be assembled from precast concrete. Precast assembly enables fast completion of commercial shops and offices with minimal labor, for example, the Jim Bridger Building in Williston, North Dakota, was precast in Minnesota with air, electrical and fiber utilities preinstalled into the building panels. The panels were transported over 800 miles to the Bakken oilfields, the building houses over 40,000 square feet of shops and offices. Virtually the entire building was fabricated in Minnesota, to complete the look of the four precast wall panel types — sandwich, plastered sandwich, inner layer and cladding panels — many surface finishes are available. Standard cement is white or grey, though different colors can be added with pigments or paints, the color and size of aggregate can affect the appearance and texture of concrete surfaces. The shape and surface of the precast concrete molds have an effect on the look, The mold can be made of timber, plastic, rubber or fiberglass, each material giving a unique finish. In modern usage, a causeway is a road or railway on top an embankment usually across a broad body of water or wetland. When first used, the word appeared in a such as causey way making clear its derivation from the earlier form causey. This word seems to have come from the source by two different routes. It derives ultimately, from the Latin for heel, anciently, the construction was trodden down, one layer at a time, often by slaves or flocks of sheep. 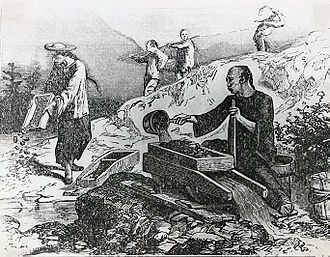 Today, this work is done by machines, the same technique would have been used for road embankments, raised river banks, sea banks and fortification earthworks. The second derivation route is simply the hard, trodden surface of a path, the name by this route came to be applied to a firmly-surfaced road. It is now little-used except in dialect and in the names of roads which were notable for their solidly-made surface. The 1911 Encyclopædia Britannica states causey, a mound or dam, which is derived, through the Norman-French caucie, from the late Latin via calciata, a road stamped firm with the feet. The word is comparable in both meanings with the French chaussée, from a form of which it reached English by way of Norman French. 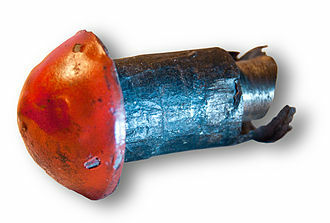 The French adjective, chaussée, carries the meaning of having given a hardened surface. As a noun chaussée is used on the one hand for a metalled carriageway, other languages have a noun with similar dual meaning. The Welsh is relevant here, as it has a verb, sarnu, a transport corridor that is carried instead on a series of arches, perhaps approaching a bridge, is a viaduct. In the U. S. a short stretch of viaduct is called an overpass, some low causeways across shore waters become inaccessible when covered at high tide. The modern embankment may be constructed within a cofferdam, two parallel steel sheet pile or concrete retaining walls, anchored to each other with steel cables or rods. This construction may serve as a dyke that keeps two bodies of water apart, such as bodies with a different water level on each side, or with water on one side. This may be the purpose of a structure, the road providing a hardened crest for the dike. Interstate 80 is a major east–west route of the Interstate Highway System, running between the U. S. states of California and New York. The highway has its terminus in San Francisco. From there it heads east across the Bay Bridge to Oakland, I-80 traverses the Sierra Nevada, cresting at Donner Summit, before crossing into the state of Nevada within the Truckee River Canyon. The speed limit is at most 65 miles per hour along the route instead of the states maximum of 70 mph. I-80 has portions designated as the Eastshore Freeway and Alan S. Hart Freeway, throughout California, I-80 was built along the corridor of U. S. Route 40, eventually replacing this designation entirely. 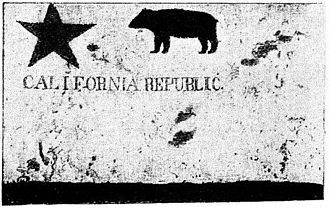 The prior US40 corridor itself was built along several historic corridors in California, notably the California Trail, the route has changed from the original plans in San Francisco due to freeway revolts canceling segments of the originally planned alignment. Similarly in Sacramento, the freeway was re-routed around the city plans to upgrade the original grandfathered route through the city to Interstate highway standards were cancelled. I-80 is recognized as the Dwight D. Eisenhower Highway in the western United States, in California, it follows the original corridor of the Lincoln Highway from Sacramento to Reno. 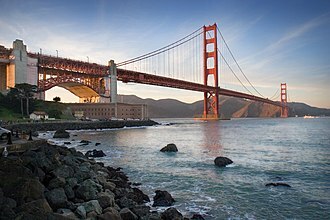 According to the California State Highway system, I-80 begins at its intersection with U. S. Route 101 in San Francisco, the Interstate designation is interpreted by some to actually beginning on the Bay Bridge approach itself, at the location of the Fremont Street off-ramp. Thus, the first 1.20 miles of the signed Interstate may not be officially an actual Interstate, the Eastshore Freeway is a segment of Interstates 80 and 580 along the northeast shoreline of San Francisco Bay in northern California. It begins at the Carquinez Bridge and ends at the MacArthur Maze interchange just east of the end of the San Francisco–Oakland Bay Bridge. Interstate 580 joins the Eastshore Freeway at an interchange known locally as the Hoffman Split in Albany. 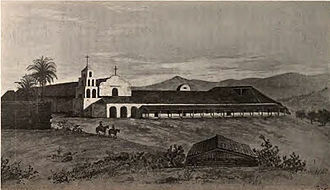 S, the Eastshore Highway began in El Cerrito at an intersection with San Pablo Avenue at Hill Street between Potrero Avenue and Cutting Blvd. Adjacent to the location today of the El Cerrito Del Norte station of BART and it was not a freeway in that access was at intersections with adjoining streets rather than by ramps. The Eastshore Highway ran from El Cerrito to the Bay Bridge along the routing as todays freeway. A causeway was constructed for this purpose by filling in part of the mudflats along the bayshore, the frontage road along the east side of todays Eastshore Freeway between Buchanan Street in Albany and Hearst Avenue in Berkeley retains the name Eastshore Highway. The terminal segment of the old Eastshore Highway in El Cerrito between Potrero and San Pablo Avenues is today named Eastshore Boulevard, the name Eastshore Freeway was applied to what is today known as the Nimitz Freeway upon its construction in 1947. 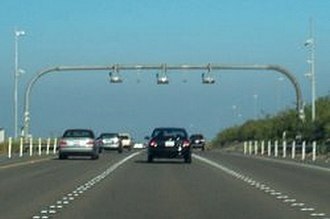 This freeway was dedicated in 1958 to Admiral Nimitz, and so for a few years in the 1950s prior, until the late 1960s, the Eastshore Freeway was designated as part of State Route 17 together with the Nimitz Freeway. Traffic congestion is a condition on transport networks that occurs as use increases, and is characterized by slower speeds, longer trip times, and increased vehicular queueing. The most common example is the use of roads by vehicles. When traffic demand is great enough that the interaction between vehicles slows the speed of the stream, this results in some congestion. As demand approaches the capacity of a road, extreme traffic congestion sets in, when vehicles are fully stopped for periods of time, this is colloquially known as a traffic jam or traffic snarl-up. Traffic congestion can lead to becoming frustrated and engaging in road rage. 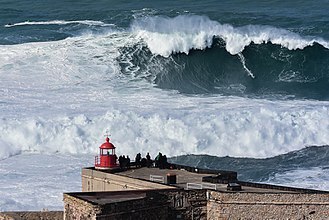 Mathematically, congestion is usually looked at as the number of vehicles that pass through a point in a window of time, Congestion flow lends itself to principles of fluid dynamics. Traffic congestion occurs when a volume of traffic or modal split generates demand for greater than the available street capacity. About half of U. S. traffic congestion is recurring, Traffic research still cannot fully predict under which conditions a traffic jam may suddenly occur. It has been found that individual incidents may cause ripple effects which spread out and create a traffic jam when, otherwise. Some traffic engineers have attempted to apply the rules of fluid dynamics to traffic flow, Traffic scientists liken such a situation to the sudden freezing of supercooled fluid. However, unlike a fluid, traffic flow is affected by signals or other events at junctions that periodically affect the smooth flow of traffic. Alternative mathematical theories exist, such as Boris Kerners three-phase traffic theory, because of the poor correlation of theoretical models to actual observed traffic flows, transportation planners and highway engineers attempt to forecast traffic flow using empirical models. These models are typically calibrated by measuring actual traffic flows on the links in the network. 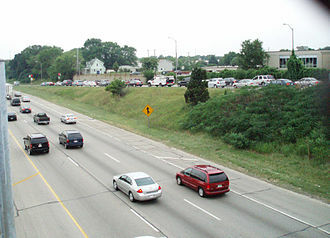 That discovery enabled the team to solve traffic-jam equations that were first theorized in the 1950s, congested roads can be seen as an example of the tragedy of the commons. The median strip or central reservation is the reserved area that separates opposing lanes of traffic on divided roadways, such as divided highways, dual carriageways and motorways. The term applies to divided roadways other than highways, such as major streets in urban or suburban areas. There is no international English standard for the term, median strip, and median divider island are common in North American and Antipodean English. Variants in North American English include regional terms such as neutral ground in New Orleans usage, among other coinages, central nature strip occurs in Australian English. Additionally, different terminology is used to traffic lanes in a multi-lane roadway. North American usage calls the lanes located closest to the roadway centerline the inner lanes, thus, it is less confusing to call these central lanes the passing, fast, or overtaking lanes in international contexts, instead of using the ambiguous inner/outer distinction. Regional differences between right-hand traffic and left-hand traffic can cause further confusion, some medians function secondarily as green areas and green belts to beautify roadways. Where space is at a premium, dense hedges of shrubs filter the headlights of oncoming traffic, in contrast to the median of a major road, those in urban areas often take the form of central traffic islands that rise above the roadway. These are frequently found on urban arterial roads, in their simplest form, these are just raised concrete curbs, but can be landscaped with grass or trees or decorated with bricks or stones. In some areas, such as California, highway medians are sometimes no more than a section of the paved roadway. The medians of United States Interstate Highways break only for emergency service lanes, on British motorways, the median is never broken, but there are no such restrictions on other dual carriageways. The median strip in the United Kingdom and other densely populated European countries is no wider than a single lane of traffic. In some cases, however, it is extended, for instance, if the road is running through hilly terrain, the carriageways may have to be built on different levels of the slope. Richmond is a city in western Contra Costa County, United States. 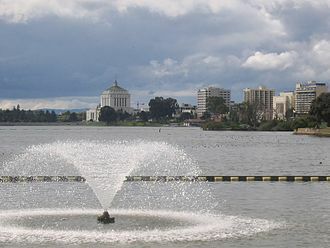 The city was incorporated on August 7,1905, under the McLaughlin Administration, Richmond was the largest city in the United States served by a Green Party mayor. 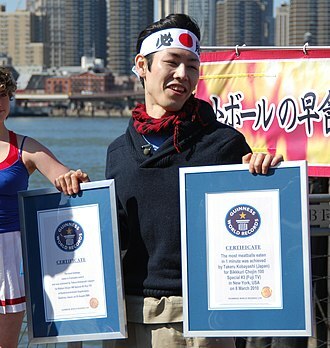 As of the 2010 U. S. Census, the population is at 103,710. 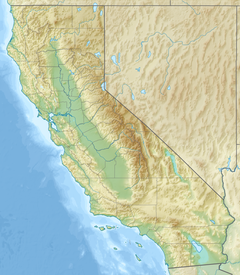 The largest, Virginia, is the namesake of the California city, the Ohlone Indians were the first inhabitants of the Richmond area, settling an estimated 5,000 years ago. 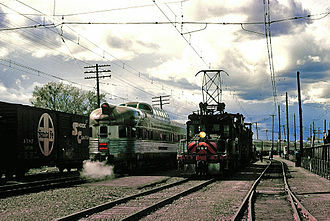 The name Richmond appears to predate actual incorporation by more than fifty years, the Atchison and Santa Fe Railroad had its terminus at Richmond. 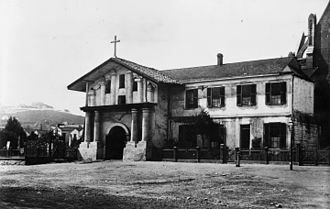 The first post office opened in 1900, Richmond was founded and incorporated in 1905, carved out of Rancho San Pablo, from which the nearby town of San Pablo inherited its name. Until the enactment of prohibition in 1919, the city had the largest winery in the world, in the 1920s the Ku Klux Klan was active in the city. 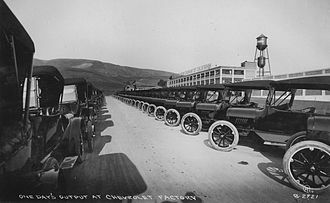 In 1930 the Ford Motor Company opened a plant called Richmond Assembly Plant which moved to Milpitas in the 1960s. The old Ford plant has been a National Historic Place since 1988, the city was a small town at that time, until the onset of World War II which brought on a rush of migrants and a boom in the industrial sector. Standard Oil set up here in 1901, including a what is now the Chevron Richmond Refinery and tank farm. There is a pier into San Francisco Bay south of Point Molate for oil tankers, the western terminus of the Santa Fe Railroad was established in Richmond with ferry connections at Ferry Point in the Brickyard Cove area of Point Richmond to San Francisco. Many of these lived in specially constructed houses scattered throughout the San Francisco Bay Area, including Richmond, Berkeley. A specially built rail line, the Shipyard Railway, transported workers to the shipyards, kaisers Richmond shipyards built 747 Victory and Liberty ships for the war effort, more than any other site in the U. S. The city broke many records and even built one Liberty ship in a five days. 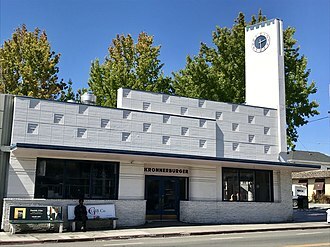 On average the yards could build a ship in thirty days, the medical system established for the shipyard workers at the Richmond Field Hospital eventually became todays Kaiser Permanente HMO. Treasure Island is an artificial island in San Francisco Bay and a neighborhood of the City of San Francisco. 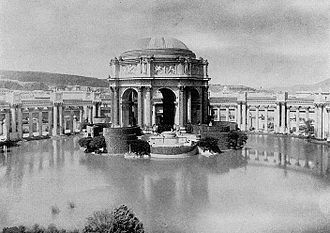 Built 1936–37 for the 1939 Golden Gate International Exposition, the islands World’s Fair site is a California Historical Landmark, the San Francisco neighborhood that includes Treasure Island extends far into San Francisco Bay and includes a tip of Alameda Island. Yerba Buena and Treasure islands together have an area of 576.7 acres with a 2010 total population of 2,500. Treasure Island is connected by a 900 ft causeway to Yerba Buena Island, the island has a marina and a bikeway connecting to the newly completed Eastern span replacement of the San Francisco–Oakland Bay Bridge. 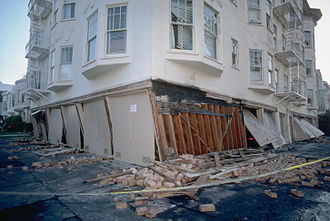 Raised walkways circumscribe nearly the entire island along five streets, prior to the islands construction by the United States government, Yerba Buena Shoals of rock north of the transbay island had less than 27 ft clearance and were a shipping hazard. The 400-acre island was constructed by emplacing 287,000 short tons of quarried rock in the shoals for the island/causeway perimeter rock walls, Facility construction had begun by March 4,1937 when two hangars were being built. The island had a lagoon, and structures included the 400-foot Tower of the Sun, the International Building, in addition to Building 2 and Building 3, remaining exposition buildings include Building 1 intended after the expo as the Pan American World Airways terminal. The expos Magic Carpet Great Lawn remains, the U. S. Navy seized Treasure Island on April 17,1942 and instead of an island airport, the city built an airport at Mills Field that became the San Francisco International Airport. 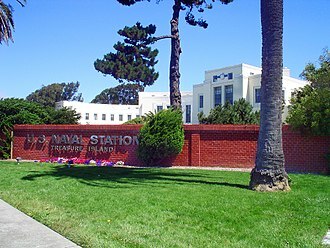 The station had a Naval Auxiliary Air Facility to support helicopters, fixed wing planes, blimps, dirigibles, in the 70s, 80s, and 90s the U. S. Navy Conducted Naval Technical Training NTTC. The U. S. Navy Rate consisted of the old Shipfitter Rate, the U. S. Navy Technical Training included NBC Warfare Decon. The New U. S. Navy Rate was classified as HT Hull Maintenance Technicians, multiple Maintenance Skills were included into The Naval Technical Training Command NTTC. During World War II over 12,000 men a day were processed here for Pacific area assignments, and thousands more were processed for separation in the aftermath of the war. Interior view of the walls, supports, and roof of a precast commercial shop. Utilities are preassembled into the precast components. Williston, North Dakota, USA. 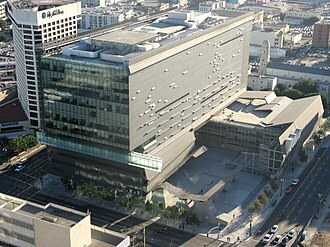 Precast parking structure showing an interior column, girders, and double-tee structural floors. The two gray circles are covers to close the lifting anchor holes. An example of a precast concrete retaining wall. The Eads Bridge on the Mississippi River, the first major bridge built primarily of steel, was constructed by one of American Bridge Co.'s antecedents in 1874. The new ferry terminal on the Key System Mole in 1933. The old ferry terminal and the end of the mole had been destroyed by a fire and explosion earlier in the year. A Key System train in Emeryville, 1909, heading west to the Mole, entering the underpass ("subway") under the mainline of the Southern Pacific under construction. 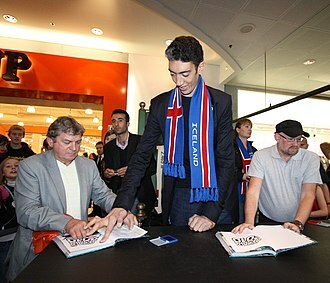 Brown sporting one of his many fashionable hats. Mayor Willie Brown at an event in the San Francisco City Hall rotunda in the 1990s. Eastern portal of the Yerba Buena Tunnel, upper deck. Pictured in December 1994. Metered ramp on I-894 in the Milwaukee area. Ramp Metering on the A19 in Middlesbrough. An E&SR streetcar in the Macdonald Avenue subway in downtown Richmond, 1906. A "Wendy the Welder" at the Kaiser Richmond Shipyards contributing to the war effort. Aerial view of the MacArthur Maze (early 1970s, prior to post-Loma Prieta rebuild); I-80 is the short curved segment in the upper left corner; I-580 runs east-west (left-right) through the center of the photograph, crossing the Southern Pacific tracks running north-south; and I-880 curves south onto the Cypress Street Viaduct at the bottom. 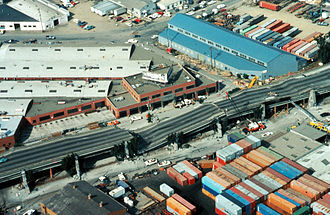 A portion of Interstate 580 following the collapse. Segmental bridge under construction, Ft. Lauderdale, Florida, USA. The Pierre Pflimlin bridge being built over the Rhine south of Strasbourg.